Another successful year for Vital Event’s Wobbleland! 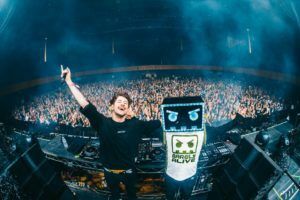 Last weekend I attended Wobbleland at the Bill Graham Civic Auditorium, a music festival that highlights bass music. They produced an outstanding lineup with artists like Rezz, Bauuer, Feed Me, Troyboi, Rusko and so many more. To accommodate for the packed lineup, there were two stages inside Bill Graham, one in the main area and another in the lounge. It only took a couple minutes to walk from each stage, so we were able to get from artist to artist quickly and without missing any of the music! Another benefit to the event’s new location, which was previously held in San Jose, was the increase in attendance. Despite the increase of attendees, there was still so much space to get groovy and the dance floor was never overcrowded. On the first night, I found myself going back and forth between the stages. Barely Alive back-to-back Virtual Riot (photo above) played a dubstep-heavy set to start off the night. And closing off the night was Minnesota, Troyboi, Midnight Tyrannosaurus, and Rusko who played some of his famous tracks like “Hold On” and “Somebody to Love”. The second night I have to admit, I stayed at the main stage, but I did hear amazing reviews about the second stage. By recommendation, I checked out Matroda who played a healthy amount of Slim Shady remixes. Then Figure and Dack Janiels played back-to-back and brought their dubstep A-game. Following was Feed Me, an artist who was on my radar when I first started listening to electronic music, played an intense set with his art as the visuals. If you’re not interested in electronic music but you do like art, the man behind Feed Me, Jon Gooch does all his own art work and he has a collection of animated monsters that are definitely worth checking out. Closing the night was Baauer and then Rezz, who went from being the surprise name last year to headlining this past weekend. Rezz always impresses with her dark and heavy sets, she truly has a sound that is very unique to the electronic world. previous post: Do LaB & Beats Antique Lightning in a Bottle Contest!